A view of the Town of Boston in New England and British ships of war landing their troops, 1768. Boston Public Library. The Tea Act, passed by Parliament on May 10, 1773, granted the British East India Company Tea a monopoly on tea sales in the American colonies. 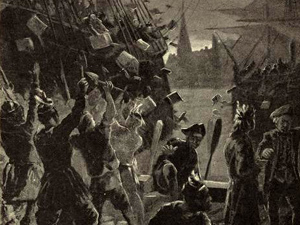 This was what ultimately compelled a group of Sons of Liberty members on the night of December 16, 1773 to disguise themselves as Mohawk Indians, board three ships moored in Boston Harbor, and destroy over 92,000 pounds of tea. The Tea Act was the final straw in a series of unpopular policies and taxes imposed by Britain on her American colonies. The policy ignited a “powder keg” of opposition and resentment among American colonists and was the catalyst of the Boston Tea Party. The passing of the Tea Act imposed no new taxes on the American colonies. The tax on tea had existed since the passing of the 1767 Townshend Revenue Act. Along with tea, the Townshend Revenue Act also taxed glass, lead, oil, paint, and paper. Due to boycotts and protests, the Townshend Revenue Act’s taxes were repealed on all commodities except tea in 1770. The tea tax was kept in order to maintain Parliament’s right to tax the colonies. The Tea Act was not intended to anger American colonists, instead it was meant to be a bailout policy to get the British East India Company out of debt. The British East India Company was suffering from massive amounts of debts incurred primarily from annual contractual payments due to the British government totaling £400,000 per year. Additionally, the British East India Company was suffering financially as a result of unstable political and economic issues in India, and European markets were weak due to debts from the French and Indian War among other things. Besides the tax on tea which had been in place since 1767, what fundamentally angered the American colonists about the Tea Act was the British East India Company’s government sanctioned monopoly on tea. 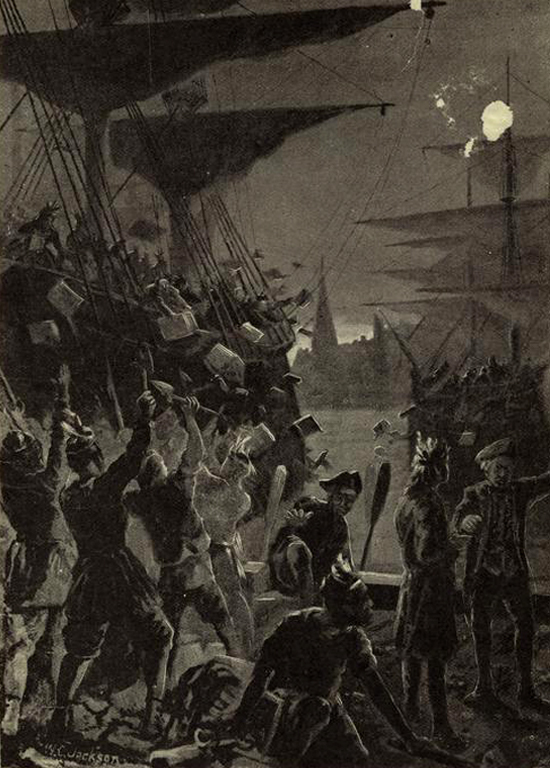 on the night of December 16, 1773 to disguise themselves as Mohawk Indians, board three ships moored in Boston Harbor, and destroy over 92,000 pounds of British East India Company tea. First edition of the Tea Act of 1773. Prior to the Tea Act, the British East India Company Tea was required to exclusively sell its tea at auction in London. This required the British East India Company to pay a tax per pound of tea sold which added to the company’s financial burdens. 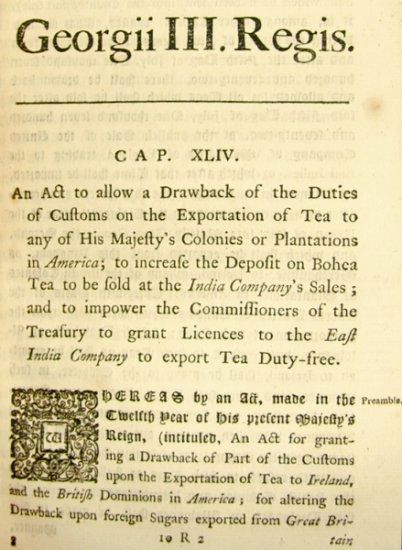 The Tea Act aborted this restriction and granted the British East India Company license to export their tea to the American colonies. This opened up the British East India Company’s markets to the lucrative American colonies. Additionally, under the Tea Act, duties Britain charged on tea shipped to the American colonies would be waived or refunded upon sale. With the passing of the Tea Act, the seventeen million pounds of unsold surplus tea the British East India Company owned could be sold to markets in the American colonies. With the passing of the Tea Act, the seventeen million pounds of unsold surplus tea the British East India Company owned could be sold to markets in the American colonies. The tea was to be shipped to the American colonies and sold at a reduced rate. The Townshend Revenue Act tea tax remained in place despite proposals to have it waived. American colonists were outraged over the tea tax, which had existed since the 1767 Townshend Revenue Act and did not get repealed like the other taxes in 1770, and believed the Tea Act was a tactic to gain colonial support for the tax already enforced. The direct sale of tea by agents of the British East India Company to the American colonies undercut the business of colonial merchants. Prior to the Tea Act, colonial merchants purchased tea directly from British markets or smuggled from illegal markets. They then shipped it back to the colonies for resale. Outraged that American merchants were undercut, colonists initially in Philadelphia and New York refused the British East India Company tea to be offloaded and sent the ships back to England. In many colonial ports to protest the Tea Act, the shipment of British East India Company tea was unloaded and left untouched on the docks to rot. 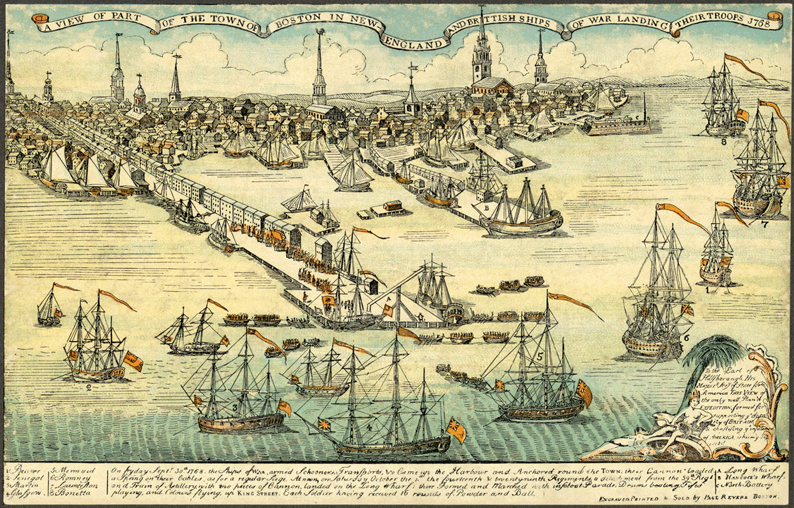 The Beaver, Dartmouth, and Eleanor arrived in Boston in late November to the middle of December 1773. The colonists, led by the Sons of Liberty, wanted the ships to return to England, and refused the unloading of the ships’ cargo of tea. Lieutenant Governor and Chief Justice of Massachusetts, Thomas Hutchinson, refused to let the ships return to England and held the Beaver, Dartmouth, and Eleanor in Boston Harbor until matters could be resolved and the tea offloaded. The framework for the Boston Tea Party was set, and on December 16, 1773, 340 chests of British East India Company Tea were dumped into Boston Harbor by the Sons of Liberty.